When you need a place that is more like home than a hotel, BTA is the solution. We offer temporary apartment rentals for people who want to feel like they are at home. 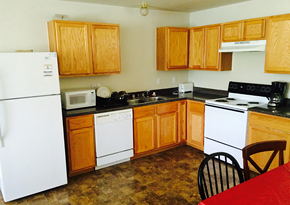 Our apartments are clean, comfortable, and are a cheaper alternative for short-period living. When you stay at one of our apartments, you can actually enjoy your temporary living experience. Whether you are permanently moving to a new location or in the military on a temporary duty assignment, find a comfortable place to stay with BTA. We offer temporary apartments for people who want to avoid living in a hotel for an extended period in Killeen, Texas. Each fully furnished apartment is equipped with everything you need, have several amenities, and have everything taken care of. The apartments are only 10 minutes away from Fort Hood, and a 5-minute walk from a grocery store and the local movie theater. The idea for our business sparked when the owner of our company sold his home, and within two weeks, found a temporary place. He enjoyed everything about it and realized there was a need for these services in the community. For more than 10 years now, we have helped people live comfortably during their stay. He is a retired veteran who enjoys helping the public. We have never had a bad review, and all of our customers always tell us how much they enjoy their experience with us.